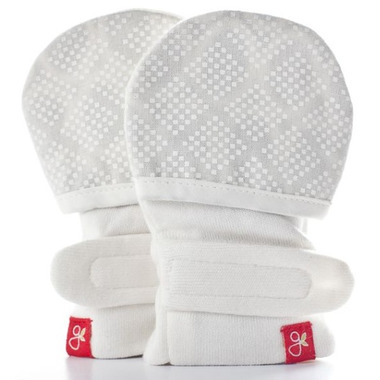 goumimitts are essential, smart, stay-on baby mittens and are designed to provide scratch and germ protection. 10% of all profits and 100% of all goumigiving print profits go to their global partners to provide aid and support to victims of human trafficking and their children. The straps ensure they stay on all day. Save my son's face from many scratches. No idea what I would have done without them for the first three months. Stays on all night. My baby has eczema on face and scalp, and scratches badly at night to the point of waking up in the morning to a scalp full of bloody scratches. With these mitts, his scalp is saved. However, the one missing star is for the sharp velcro that gives my baby scratches on face ðŸ˜� No matter how well I cover the velcro, the corners seem to eventually always lift up. Overall, these have saved my babyâ€™s scalp. So soft and always stay on. The straps make them so easy to put on. This is my second time I purchased the mitts. The first one came in a newborn set with booties and a small bag for laundry. Bought this one so I will never be without! The only one I found that really stays on baby's hands.